This painting is lovely in its simplicity. The red-tiled shelf, on which sits the sturdy, stoneware jar - of the kind employed for generations to store foodsffs and kitchen goods - might well represent Tarpley's own scullery. But it is the rich display of michaelmas daisies, in all their soft and subtle colours, which is offered for our attention. 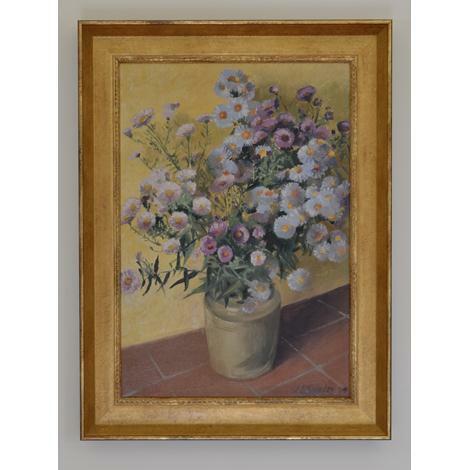 The perspective of the picture has been gently manipulated, to throw the flowers forward, close to the picture plane, allowing the viewer to look down into the mass of blooms. This is a gentle painting, quite thinly and swiftly executed, with a wonderful array of secondary and tertiary complementary colours.